Genus: Guatteria Ruiz & Pav. This species is accepted, and its native range is S. Venezuela to N. Bolivia. Nativa en Colombia; Alt. 100 - 300 m.; Amazonia. Maas, P.J.M., Westra, L.Y.T., Arias Guerrero, S., Lobão, A.Q., Scharf, U., Zamora, N.A. & Erkens, R.H.J. (2015). Confronting a morphological nightmare: revision of the Neotropical genus Guatteria (Annonaceae) Blumea 50: 1-219. Maas, P.J.M. & Westra, L.Y.T. (2011). 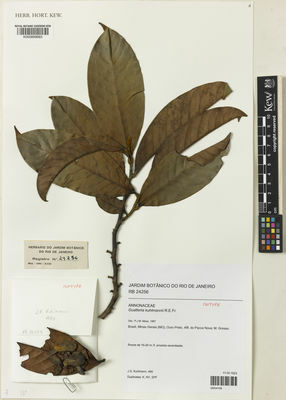 A taxonomic survey of Guatteria section Mecocarpus including the genera Guatteriopsis and Guatteriella p.p. (Annonaceae) Blumea 56: 113-145.